Home » » Is General Practice good value for money? Last year taxpayers spent A$6.3 billion on GP services through Medicare, about 6% of the total government health expenditure. The authors of the Bettering the Evaluation and Care of Health (BEACH) program published in the Conversation their assessment of whether this represented good value for money. 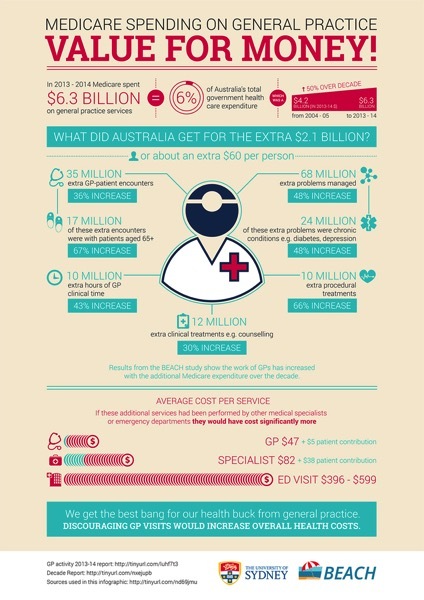 We get the best bang for our buck from General Practice. It is cheaper to pay for someone to see their GP every week for a year then it is to pay for them to be admitted to hospital for just one day.